Strathpeffer Pictish Stone, Easter Ross, Scotland. OS grid reference: NH 4849 5850. At the edge of a field at the north-eastern side of the village of Strathpeffer, in Easter Ross, Scotland, stands a 7th century Pictish symbol stone known as ‘Clach an Tiompain’ or Tuideain (The Eagle Stone) – ‘Stone of the Turning’ or ‘The Sounding Stone’. The stone was ‘said’ to have marked a battle that took place in 1411 between two warring Scottish clans, and there was also a 17th century ‘prophetic’ legend associated with the stone. It is located at the edge of a field beside a line of trees at the north-eastern edge of the village – just off Nutwood Lane – and 85m south-east of Nutwood House – the stone lies 150m west of the A834 (Dingwall road). About 1 mile to the east along the A834 is St Clement’s kirk, Dingwall, and in the kirkyard a second Pictish stone. This Class I Pictish symbol is thought to date from the 7th century at which time the Pictish kingdom was ruled by the powerful King Bridei, son of Bili. It is made of contorted blue gneiss and is 2 ft 8′ high (81cm), according to Elizabeth Sutherland in her work ‘The Pictish Guide’. It is 24′ wide x 10′ thick. On its front (SE) face are carved two Pictish symbols: an eagle and above that an arched horse-shoe which has tiny circles with dots in them at the bottom of both arches and, another slightly larger circle with a tiny circle and dot inside that at the top – which are held by curved strands almost forming two more circles. There are no carvings on the reverse side. Sutherland says the eagle represents St John the Evangelist and means: justice and truth, while the arched horse-shoe signifies ‘a rainbow bridge between this and the other world’. The stone has suffered from slight damage at the top right side due to being moved about on a couple of occasions; it originally stood further down the hill in the direction of Dingwall, but was brought to its current position in 1411. It has also come to be referred to, in more recent times perhaps, as ‘the Marriage Stone’. The stone was traditionally said to stand on, or near, the site of an early 15th century battle between two Scottish clans: the Munros and MacDonalds – the clan Munro being victorias. Curiously the Munro clan symbol is the eagle! Local legend has it that the slain of the Munroe clan lie buried around the stone. The Mackenzie clan seemingly ‘also’ had some involvement here. And there was also a legendary ‘prophetic’ claim made by the 17th century Highland prophet Coinneach Odhar – better known as Brahan Seer (who was of the clan Mackenzie). He said that if the stone “fell” for a third time the Strathpeffer valley would flood right up to the stone (Sutherland, 1997). 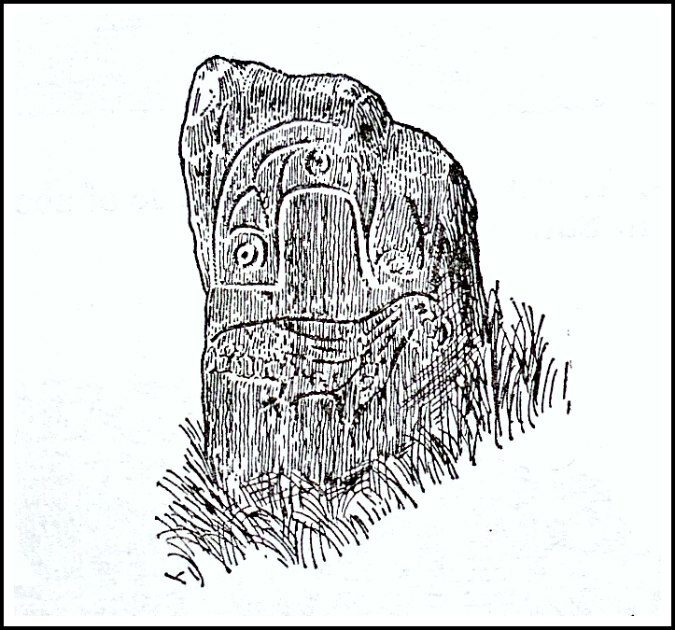 Linked to the Strathpeffer stone is the Dingwall Pictish Symbol Stone. This stands in the kirkyard at the left-side of the entrance path to St Clement’s kirk, but this is now badly weathered – Anthony Jackson ‘The Pictish Trail’. So were these two stones originally ‘a pair’? Jackson, Anthony, The Pictish Trail – A travelers Guide To The Old Pictish Kingdoms, The Orkney Press Ltd., St Ola, Kirkwall, Orkney, 1989. Sutherland, Elizabeth, The Pictish Guide, Birlinn Limited, Edinburgh, 1997. Categories: Pictish Symbol Stone | Tags: Strathpeffer Pictish Stone in Easter Ross in Scotland | Permalink.